The hippie sandwich was invented at 3:00 AM, on 4/1/1967 by Moonglow and Raincloud, two groovy but notoriously cranky hippies who inadvertently opened the first "crash pad" in the Haight, after a rap session that got heavy over the issue of whether avocado is a vegetable ("Raincloud's Law") or fruit ("lighten up, man"). Earlier attempts at a tomato-and-grass sandwich proved to be too "cud-like." Raincloud accidentally spilled seeds in the aquarium in the mistaken belief it was fish food. After discovering the resulting (thoroughly-washed) sprouts, Moonglow substituted them for the grass, to unanimous approval from the pulsating jellyfish in the refrigerator and the melting wallpaper. 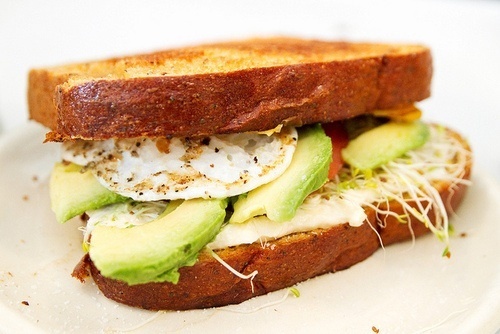 Sandwich historians disagree whether the addition of avocado was the final step in the creation of the hippie sandwich, the zenith of contemporary sandwich technology, but many dispute Moonglow's last-minute addition of that crusty white thing. In subsequent interviews, she claimed; "it couldn't be an egg fried in that pan nobody ever washed, because I had a hang up about chickens ever since an eight-foot-tall one chased me around the Fillmore. I don't remember what it was. Maybe a piece of paper I peeled off my sandal? It doesn't surprise me, because I was finding out why he called himself "Raincloud"
Those things are heavy as hell! Do you know this guitar? I just saw it on an image search and the word "groovy" popped into my head. And it is. Sure...they had one at Chicago Music Exchange. As Bill mentioned, it was a short lived run from Gibson - the SG Zoot Suit. It's multiple laminates of birch. I believe they were around 9 lbs but I could be wrong. Just felt heavy to me...probably because SG's are typically light. I have one. 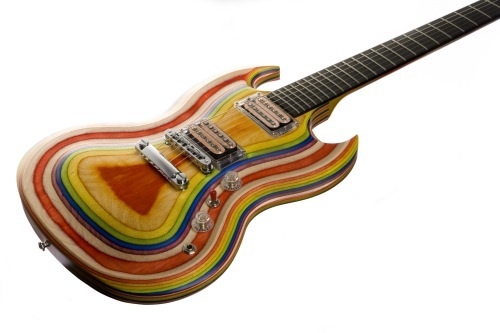 The entire guitar is made from laminated 1/8" dyed birch. I wouldn't call it a heavy guitar - maybe a little heavier than a regular SG. I picked it up used, but in almost new condition. What surprised me was how rough the finish was! I had to sand it down with 0000 steel wool to get it smooth to the touch. It is currently out on loan to a friend trying to learn how to play. When I get it back, I'll probably put it up for sale, if anyone is interested. Now I'm curious. My Historic SG with Maestro weighs 7.8 lbs. The Gibson site says the Zoots weigh over 7.1 including only the wood. I wonder how much weight is added by the hardware, plastic and electronics? I looked at at one for my (then 10 yr old) daughter because she thought it was so cool, but I remember thinking it'd be too heavy for her. She wound up going with a Fender Pawn Shop Mustang which was less than 6.5 lbs.